Note: The Chinatown branch has moved to Ion Orchard. The restaurant is decorated very grandly. The service wasn’t too bad although (1) I don’t like how the manager was so familiar with us. If I go somewhere expensive, I want to be treated like a king, the servers have to be obsequious, and (2) we four were seated face-to-face in a sort of Japanese cabin, so the waitresses could only serve food from one end of the table and not reach the two persons sitting on the other end. This is terrible because if we are paying service charge, I want to be served and not to be passed food to set it myself on my own space. We had a problem deciding if we wanted the set meal or individual dishes. When Meng came, he rapidly ordered without even looking at the menu. We ordered XO sauce fried carrot cake; peking duck; spinach with three kinds of eggs; stuffed scallops with broccoli; lamb; duck noodles and desserts. We ought to order the famous sharks’ fins but we were too full to eat anymore. 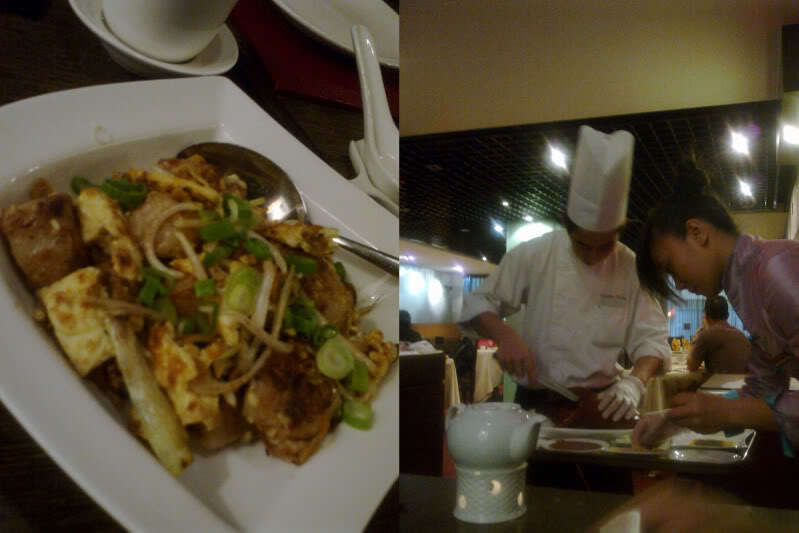 the XO sauce fried carrot cake at Ion is supposed to be very good but I thought this one was tasteless and too little. Everything else was ok, the dishes were perfectly executed in such a way that, for example, the lamb didn’t have the mutton stink, and was soft and tender but the dishes (except for one) lacked the “wow.” There was something flat and lackluster about them. The best two dishes were the spinach with three kinds of eggs and duck noodles. The unique aspect of the spinach was the soup, the chef must have used a superior stock to cook it; the soup was heavenly, packed a punch, had the “wow” factor. The noodles was very strange because it was like drinking or smoking or taking drugs. At first, it was bad, the first mouthful was gooey and I wondered if they used the bone-pulverized-to-soup-stock or just too starchy. But the more I ate, the more addictive it became. It gradually grew on me. The motto of my life is: Try everything once. That’s why when they asked what Chinese tea we wanted, I got the one I never heard before. Something with the word “red” (红) in it. 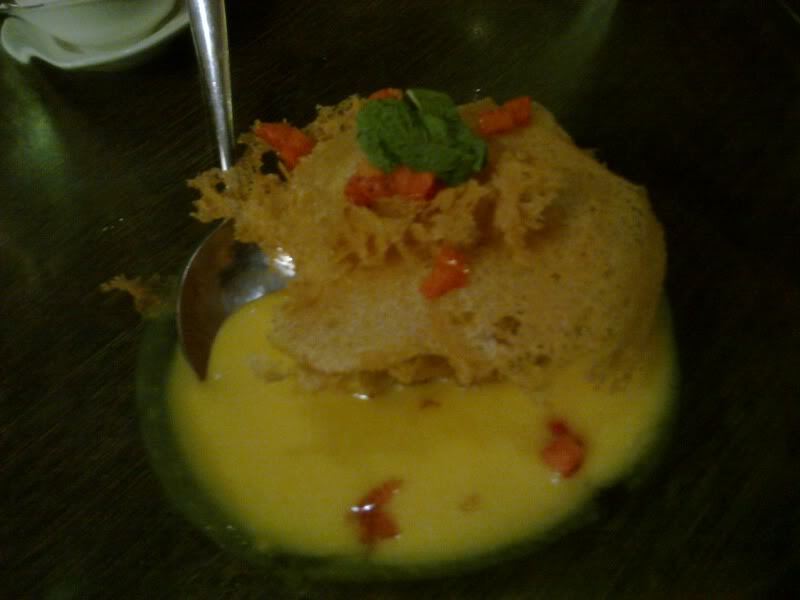 For dessert, I ordered Fried Durian Ice Cream with Mango Puree. IT SUCKED. 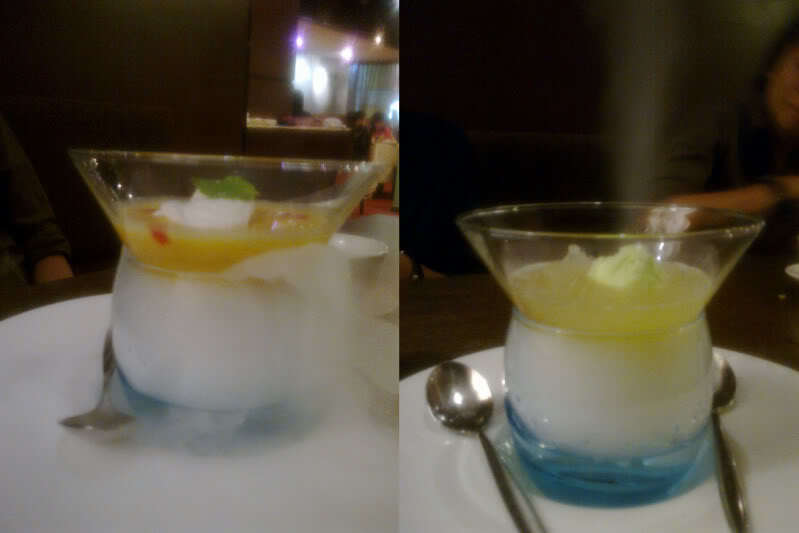 The crisp tasted of oil; the durian paste (not ice cream) was inferior and the durian didn’t go well with mango at all.